DL Manufacturing of North Syracuse received a $145,000 loan to roll out a new loading dock product for the warehousing industry. Cayuga Press of Cortland obtained a $75,000 working capital loan to complete its transition to newer, larger facilities. Energy Masters, LLC of Canastota manufactures and installs lightweight photovoltaic panels for rooftop applications. The company was approved for a $100,000 equipment loan to purchase specialized production equipment. Oneida Lake Ready Mix received a $75,000 working capital loan to support the opening of a new concrete production facility in Central Square. All Seasonings Ingredients of Oneida packages spices and ingredient mixes for the food processing and other industries. The company obtained a $125,000 equipment loan to acquire processing equipment that will allow it to expand its offerings and customer base. Critical Link Technologies of East Syracuse has developed a scientific camera product that will be used in research application in a wide variety of fields. It received a $100,000 working capital loan to support sales of this unique product. 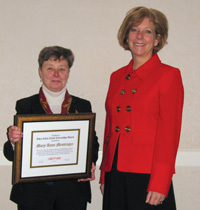 Mary Ann Messinger was named the recipient of the 24th annual Rhea Eckel Clark Citizenship Award at the Central New York Regional Planning and Development Board's annual meeting that was held on December 16, 2009. Ms. Messinger was born in Syracuse and is a life resident of the Bridgeport community in Madison County. Ms. Messinger received a bachelor of history degree from Trinity College in Washington, DC, and a master of human resource management from Chapman University in Orange, California, and began her professional career in Central New York working as a teacher in the Chittenango School District. During this time, she organized a number of community volunteer groups to help supplement the District's staff resources. Ultimately this work led to Ms. Messinger being elected to a seat on the Chittenango Board of Education where she served for many years, several as its Chairperson. Her work in the education field included several terms of office as a member of the Central New York School Board Association during which time she was honored with the Association's President's Award and Dedicated Service Award. Ms. Messinger also spent time working in close association with the NYS School Board's Association, where she traveled around the State to conduct seminars and training sessions on school board policy and board superintendent relationships and responsibilities. In addition to her work in the field of education, Ms. Messinger became immersed in community planning issues first in the Town of Sullivan and then as a member of the Madison County Planning Board. This community service work led to her appointment as a member of the CNY RPDB, where she has served for many years including several terms as Chairperson. During this period, she also served on the board of directors and as chairperson of the NYS Association of Regional Councils. Ms. Messinger continues to serve as a member of the CNY RPDB and currently serves as Chair of the CNY Enterprise Development Corporation, a non-profit organization established by the CNY RPDB to manage a regional small business loan program in Central New York. In October 2009, the FLLT—working under contract and with funding provided by the CNY RPDB—completed work on the Skaneateles Highlands Conservation Planning and Stakeholder Project, an assessment of natural resources and an engagement with local communities and stakeholders to assist them in envisioning options for conserving significant open space resources within the regionally significant and beautiful Skaneateles Highlands. The twenty-four page color report was designed to be accessible to the public and was distributed to each municipality within the Skaneateles Highlands area. The illustrated report includes detailed maps and information about natural and cultural resources, physiological components, opportunities, threats, accomplishments in conservation, and recommendations, including a list of priority conservation lands, two recreational trail plans, and important land use tools that will help municipalities to conserve these important lands. The Central New York Regional Planning and Development Board received an award from the USDA Rural Business Enterprise Grant program in September 2009 to fund a feasibility study for establishing a community wind farm in Fabius, NY. Community-based wind energy projects are typically developed with a substantial level of local resident investment and control rather than exclusively by national or international developers, and can provide greater benefits for the local host community. The study will include an on-site assessment of the community's wind resource, an analysis of the potential electricity production capacity, and an evaluation of options to establish a local wind energy development company to pursue subsequent phases of the project. The CNY RPDB received an award from the USDA Rural Business Enterprise Grant program in September 2009 to establish a program to loan wind energy testing equipment to assist property owners in assessing the feasibility of developing wind energy projects for their farms or businesses. Applicants will be selected based on their desire and ability to install a wind turbine system as well as the suitability of the property's location based on its wind energy potential as determined by the CNY RPDB. The CNY RPDB will provide wind energy testing equipment on a temporary basis, as well as funding to cover the cost of installation, decommissioning and data analysis. Property owners will be responsible for costs of permitting and insurance. A Restore NY-Round 3 Grant was awarded in September 2009 in the amount of $818,717.00 for the North Jefferson Street Revitalization Project in the Village of Pulaski. 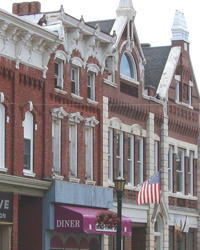 The grant will facilitate the revitalization of four buildings in or adjacent to the Village of Pulaski Historic District. The North Jefferson Street Revitalization Project was envisioned as a direct result of the recently completed joint Town of Richland and Village of Pulaski Comprehensive Plan produced by the CNY RPDB in collaboration with the communities of Richland and Pulaski. Included in the project is the historic Kallet Theater building which is planned to be rehabilitated as the Pulaski Performing Arts Center, a regionally-important, multi-use events and conference space at the heart of the downtown business district. 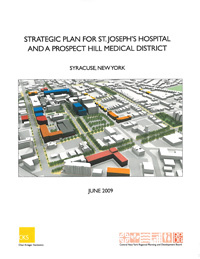 In June 2009, the CNY RPDB completed work on a strategic plan for St. Joseph's Hospital and a proposed Prospect Hill Medical District in the City of Syracuse. The study was undertaken in 2008 at the request of the hospital and was led by a consultant team retained by the CNY RPDB that included the urban design firm Chan Kriegor Sieniewicz from Boston, MA. Funding for the study was provided by a grant secured by the CNY RPDB from the federal Economic Development Administration, St. Joseph's Hospital, and the Syracuse Industrial Development Agency.